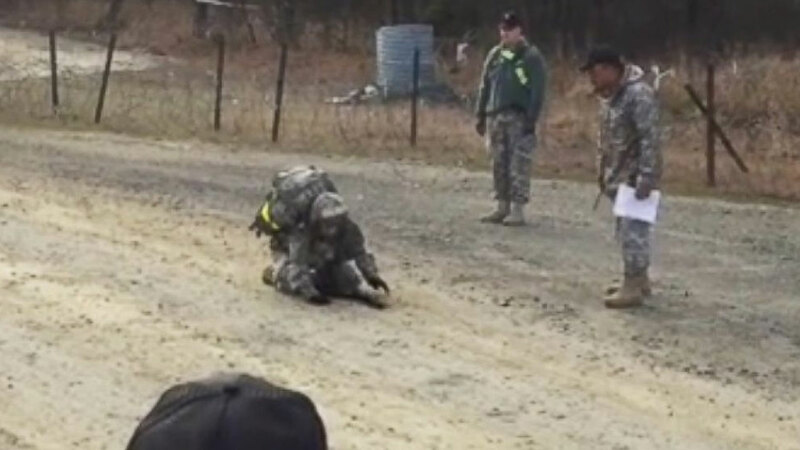 FORT DIX, N.J. (WLS) -- Video of an Army captain's grueling march is going viral after she refused to quit at the finish line. Capt. Sarah Cudd was "five feet from failure" as she finished a 12-mile march in three hours, while carrying a 35 lb. pack and a 5 lb. weapon. "When I fell the second time and could look up and see the finish line, that was really good motivation to get up," Cudd told ABC News. Cudd says she was having trouble standing up straight as she approached the finish line, but was cheered on by her colleagues. "I was thinking about the 10 days of training I'd gone through and how hard we'd all worked to get here and thinking about going home to see my husband," Cudd said. "That combined with all the encouragement I was getting from my friends and cadre was what got me up and over the finish line." Cudd and other candidates earned their Expert Field Medical Badge for passing a series of rigorous tests for Army medical professionals. 239 people had began the process, but only Cudd and 45 others finished it, including just 14 women, according to a spokeswoman for the U.S. Army Public Health Command. "Relief was the only thing I felt after I was done," Cudd said. "Relief and gratitude to all those who were supporting me and willing me to the finish line."